After many many car trips to random houses in the bay collecting 100 year old chimney brick and a days worth of laying we are finally done. We chose a herringbone pattern which was a little more complicated but totally worth it. The whole project was pretty easy just time consuming. 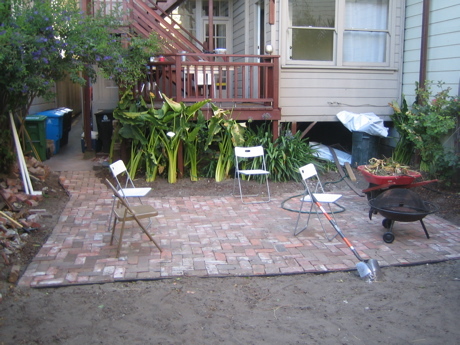 A little research, making sure your patio is square, and grading the dirt before the sand is all you need to do. More pictures and a video will follow once the lighting and beds are done. very nice! when’s the bbq? John, what a beautiful job you guys did. You inherited your dad’s talent. I can’t wait to see the finished product. Looks like a great job. Be sure you have a long lease. You don’t want your landlord to get a windfall from your hard work and dollars.